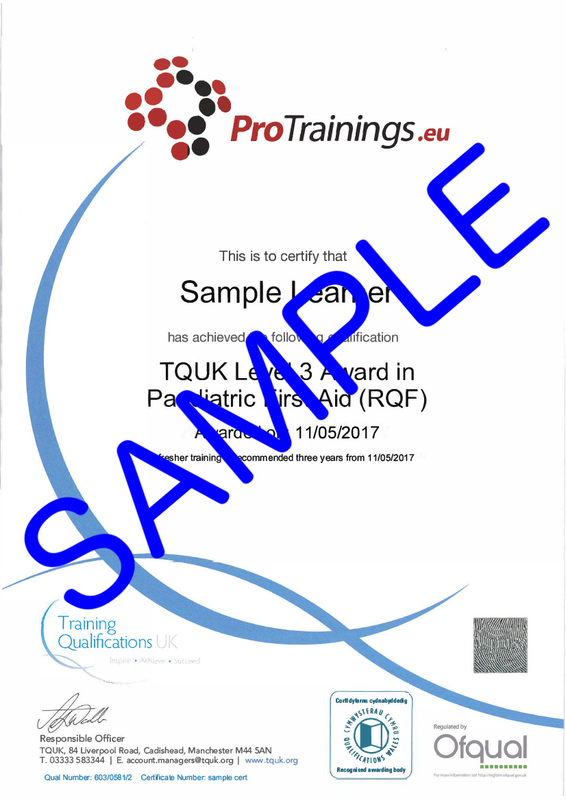 TQUK Level 3 Award in Paediatric First Aid (RQF) Blended Part 2 for those who have completed the online part. We are the only company to be able to offer an alternative to the 2 days in the classroom for childminders and carers who need to complete a Paediatric First Aid Course to comply with the requirements of Ofsted, EYFS, CSSIW and SureStart. Our blended course offers a video-based online course that is completed before attending a full day in the classroom with an instructor to complete the practical part of the course. ProTrainings Paediatric courses are approved by most councils across the UK. All our first aid courses fully meet the UK and European Resuscitation Council Guidelines 2015 as per the HSE requirements and all our Paediatric courses meet the latest 2019 learning outcomes laid down by the Awarding Organisations. 4. Know how to provide first aid to an infant or a child with an acute medical condition or sudden illness. 4.2 Identify how to administer first aid for an infant or a child who is suspected to be suffering from • Diabetic emergency • Asthma attack • Allergic reaction • Meningitis • Febrile convulsions. 5. Know how to provide first aid to an infant and a child who is experiencing extremes of body temperature. 9.3 Demonstrate the use of a training device adrenaline auto-injector.